The full set of all 122 shiurim (122 hours covering all of shas) is available on 3 DVDs (compatible for MP3) for $99.95. This includes postage and handling. 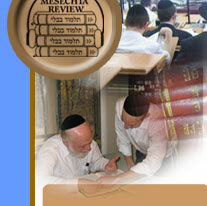 The full set of 122 shiurim on DVD is available at the discounted price of $74.95 for schools, mechanchim or rabbonim. This includes postage and handling. Individual sample shiurim are available for free by calling Kol Haloshon in the USA at 718-906-6400 or your local Kol Haloshon number in the USA or Israel, going to the gemora section and then pressing shiur #9 in the daf yomi menu. You can also download individual daf yomi shiurim online for free at www.chinuch.org (in the audio visual section of the website) or on Dial A Daf (if you are a member).